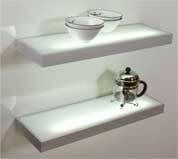 • The glass shelf is easy installed. • 220 – 240 V / 50 – 60 Hz. • Long-life T5 fluorescent tube, 4,000 K, cool white (8 – 21 W), 6,000 – 8,000 hours. • Power supply directly from the wall behind or the side.